In 2014, award-winning journalist Reni Eddo-Lodge wrote about her frustration with the way that discussions of race and racism in Britain were being led by those who weren’t affected by it. She posted a piece on her blog, entitled: "Why I’m No Longer Talking to White People About Race." Reni Eddo-Lodge is a London-based, award-winning journalist. She has written for the New York Times, the Voice, Daily Telegraph, Guardian, Independent, Stylist, Inside Housing, the Pool, Dazed and Confused, and the New Humanist. She is the winner of an MHP 30 to Watch Award and was chosen as one of the Top 30 Young People in Digital Media by the Guardian in 2014. She has also been listed in Elle’s 100 Inspirational Women list, and The Root’s 30 Black Viral Voices Under 30. She contributed to The Good Immigrant. Why I’m No Longer Talking to White People about Race is her first book. It was chosen as Blackwell’s Non-Fiction Book of the Year, longlisted for the Baillie Gifford Prize and shortlisted for the Books Are My Bag Readers Award for Non-Fiction. "This political, accessible and uncompromising book has got people talking about race and racism in Britain." 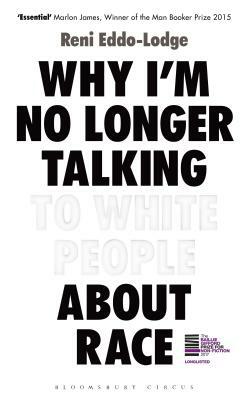 - Guardian, "Books of the Year"
"Why I'm No Longer Talking to White People about Race by Reni Eddo-Lodge is a timely and sparky discussion about a vital subject." - Times Literary Supplement, "Books of the Year"
"Extremely Illuminating." - Forbes, "Leaders' Books of the Year"
"I found Why I'm No Longer Talking to White People about Race by Reni Eddo-Lodge timely and resonant. The author's passages on intersectionality are particularly poignant. It's a powerful and important read, relevant and accessible whatever your race." - Observer, "Books of the Year"
"Why I’m No Longer Talking To White People About Race . . . look[s] at racial dynamics in the UK, and does so with intelligence and poignance. Eddo-Lodge's journalism background makes the book the perfect mixture of fact and opinion, resulting in a book that will probably teach you a lot about Britain’s racist history." - Cultured Vultures, "10 Best Books of 2017"